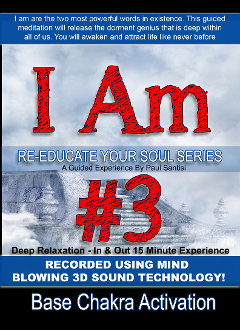 Due to the Worldwide positive response here is I AM #3 in a quick 15 minute in & out deep relaxed version. This time with more affirmations a different tone and intention. Combined with base / root chakra clearing music! This audio also will remove negative blocks that are holding you back from releasing the unstoppbale you. So powerful - so efective - such an amazing experience all in 15 minutes!